perhaps the title is a bit on the dramatic side, but i do think i've got a small taste of 'over-kill' when it comes to babies and knitting and crocheting these days! i am LOVING these tiny little treasures of yarn ... searching through patterns and catching glimpses of those chubby little cheeks and squishy knees and thighs that seem to segue into a ball that we call an ankle/foot! tiny toes, sleepy eyes, pink pursed lips ..... oh my soul! i've got it BAD! perhaps it's the fact that i can knit or crochet a little hat in ..... an hours! it has proven to be quite the stash buster, and for that i'm grateful. perhaps it's the simple reminder of how sweet and innocent those little one are, and it is with that same mindset that God wants us to come to Him! perHAPS it's the hope of what lies in store for me in the years to come within my own family ..... dreaming of that next chapter in my life. regardless, it has been a wonderful inspiration of yet another venue to use the things i've learned; to put into practice, to give away, to share, to shower someone else with a little bit of "happy" when they least expect it! I've noticed that when you tell someone what you're knitting and hold up that tiny bundle of stitches their face bursts out with a huge grin, and the worry line soften and joy gently spreads across their countenance! i have a new book of "critter hats" and the pictures alone make the book worth buying! at the end of a rough day i simply sit and flip through those little children wearing the various hats and i just giggle! 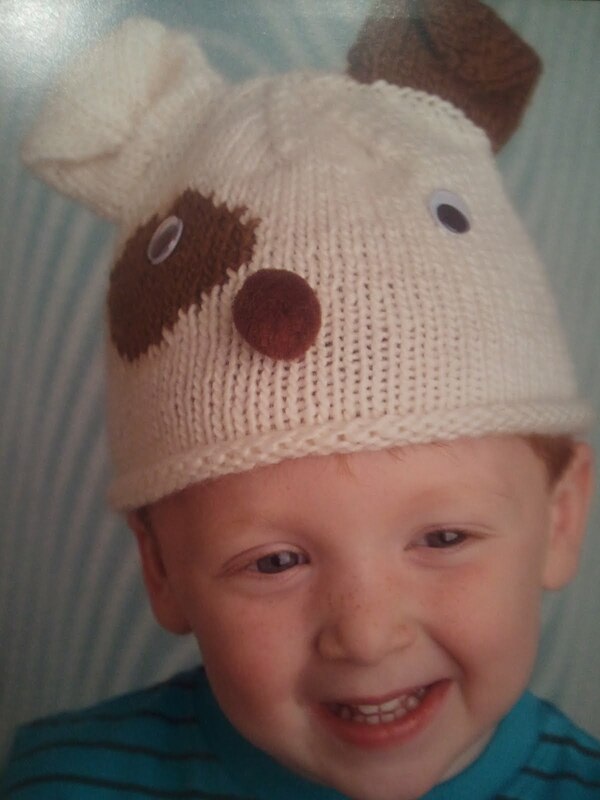 one such hat is a little dog - a basic white hat with a brown "patch" over his eye, a white ear and a brown ear! The original pattern calls for the hat to be knit flat and then seamed up the back. By knitting it flat you can work the "patch" in a different color. However, i have opted to work it in the round and that makes adding extra colors using intarsia pretty much impossible. 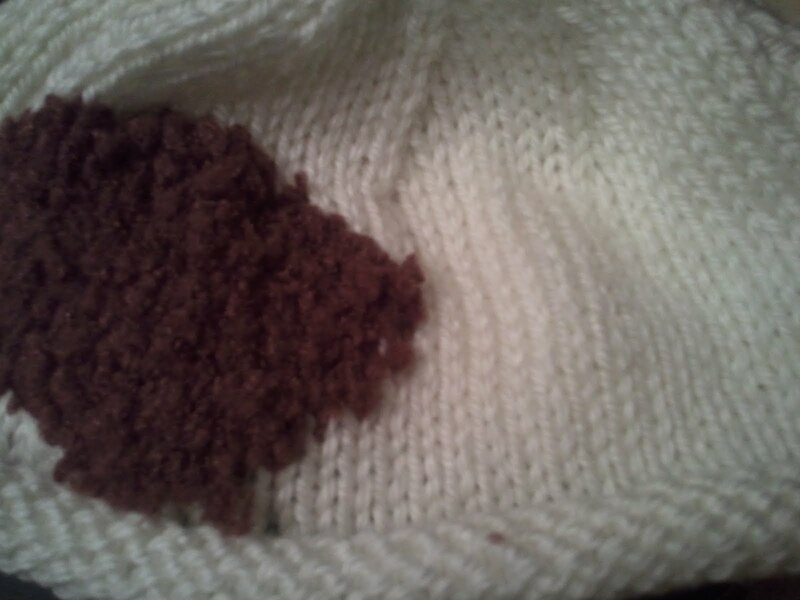 So .... i pulled out my lessons for duplicate stitch and have accomplished the same effect ..... in a very easy method. Duplicate stitch is simply that: an echo of the original. All you need is a crewel needle with an eye large enough to accommodate your "new" yarn color. Once you have identified the stitch pattern you simply start at the base of your original knitted stitch, coming from behind the work and up and out through the base of the stitch. You pull the yarn through and insert the tip of the needle, from right to left, under the legs of the stitch that is above your original stitch. Can you see how you are simply imitating a knit stitch, by hand. Once you pull your yarn through this top section, you complete the stitch by returning the needle and yarn into the beginning point at the base of the stitch. Thus, you have Duplicated the stitch. and you then move on to the next stitch in the row. Working row by row, you can add layers of color, weaving in the tails as you progress, and can achieve an intarsia look without all the extra bobbins dangling behind your work. "they" say that imitation is the highest form of flattery, and yet that is exactly what Christ has called each of us to do... to be imitators of Him. and in a day and age when so many people are 2nd guessing their decisions and choices, how refreshing and simple - actually - is it for us to simply imitate a life that has already been lived ... to follow in His footsteps, to adopt His mindset and heart .... it really doesn't get much easier than this! we seem to be the cog in the wheel that clogs up life and makes it much harder than it has to be! Blessed are those who have learned to acclaim You, who walk in the light of Your presence, O Lord. They rejoice in Your name all day long; they exult in Your righteousness. My zealousness and passion for this phase of knitting may be just that: an obsession over something new and different, and YET! HIS obsession over me is nothing new to Him! He continues to daily choose me, to daily continue investing and believing and forgiving me .... i am HIS Magnificent Obsession! there's no internet in the trees . . .